BYU may not be of the world, but by being in the world, the university and its students still deal with many troubling issues. Sexual assault is one of them. In his campus devotional address, Family, Home, and Social Sciences Dean Benjamin Ogles, as a member of the Advisory Council on Campus Response to Sexual Assault, spoke on this poignant topic. He focused on the accountability, agency, and the healing power of the Atonement of Jesus Christ in relation to sexual assault. “Sexual assault is a difficult, highly charged, and sometimes political topic not easily discussed in any setting…I did not volunteer to participate on the advisory council and certainly never imagined that I would deliver a devotional focused on the gospel doctrines associated with sexual assault. Yet my experiences led me to this moment where I feel an urgency to address this delicate topic,” said Dean Ogles. Of the 12, 739 students who answered the question concerning experiences of unwanted contact in the university’s Campus Climate Survey on Sexual Assault, 475 (3.7%) had experienced some form of such contact while enrolled at or attending BYU in the 12 months prior to the survey. There were 1,692 surveyed students who reported that they had experienced sexual assault or abuse as a child or adolescent prior to coming to BYU. Dean Ogles framed the discussion of assault in terms of the gospel principles of accountability, agency, divine creative powers, and the Atonement. Agency gives us opportunities, accountability requires us to take responsibility, and the Atonement allows us to repent and progress. In addition, sexual intimacy, when used within the boundaries of marriage, can be positive and healthy. “I believe some instances of unwanted sexual contact at BYU occur because one person assumes the other is interested and ‘goes for it’ without ever checking to see if their perception of the other person’s wishes is accurate,” shared Dean Ogles. One reason people do not come forward and get help after being sexually assaulted is because they blame themselves. They might think that if they had acted differently, the assault would not have happened. Oftentimes, third parties hearing about the assault may think the same. To illustrate how incorrect these thoughts are, Dean Ogles shared the story of when his family moved to a small town in Ohio. On their first night there, someone broke into their car and stole the items inside. The Dean’s first thoughts were of self-blame: Why didn’t I lock the doors? I should’ve parked away from the street. If only I had been more alert. “I automatically took the blame because I could imagine things that I thought I should have done differently,” said Dean Ogles. His actions, however, never would have changed the fact that what the thief did was illegal and wrong. There was no reason to blame himself. The same is true of victims of sexual assault: no matter what the victim does, the perpetrator’s actions are still illegal and wrong. Understand that Satan will try to convince you that there is no hope for your future. “There is hope!” said Dean Ogles. 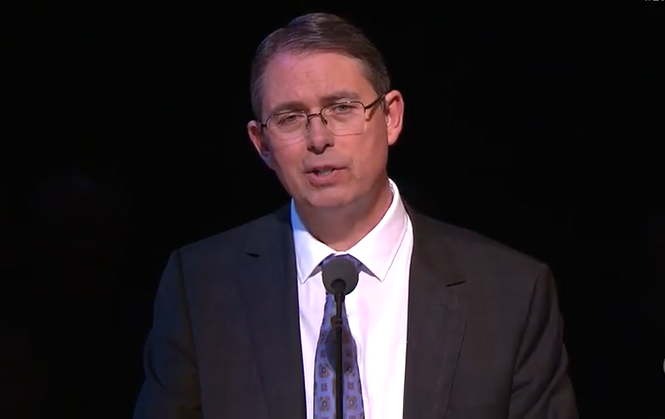 He advises survivors to read Elder Scott’s talk and to utilize available resources on lds.org. When we respect others’ agency, especially in healthy relationships that can lead to, and thereafter enrich, covenant marriage, we have the potential to jointly, mutually, and consensually engage in an intimate and eternal marriage that can bring us a fullness of joy with our families in the presence of our Eternal Father. The full devotional is available for viewing at BYUtv.org and the text will soon be available on the BYU Speeches website. Madelyn Lunnen contributed to this article. Reblogged this on marketing businesses.